Brunch is so underrated, especially for us busy mums. Organising a home, doing school runs and fitting in the gym leaves no time for lazy breakfasts in our household. And having teenagers means no early weekend mornings anymore, brunch is a firm favourite in Christie household. I remember when Sunday morning started at 6am; sitting with the proverbial match sticks keeping my eyes open whist the boys built endless wooden cities and train tracks. But there is hope! As soon as teendom kicks in then weekends are made for lazy mornings, endless cups of strong coffee as you catch up on the Sunday papers and prepare brunch. 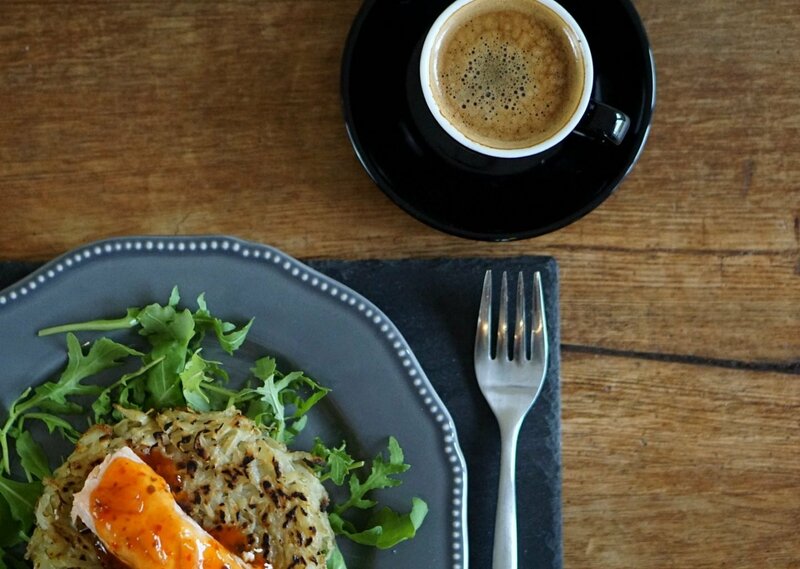 Today I am going to share this oh so delicious salmon and rosti brunch recipe, perfect for such mornings. I could eat Salmon at any time of day; it is most definitely my favourite food ever. 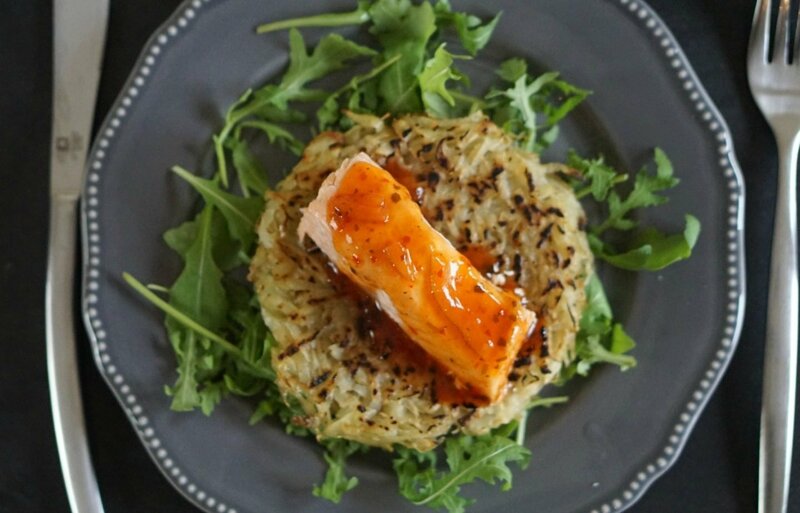 How to make Salmon On A Bed Of Potato Rosti? A tall claim I know, but I actually can’t think of a bad recipe, or of a salmon dish I don’t like. So let me share my new favourite with you. 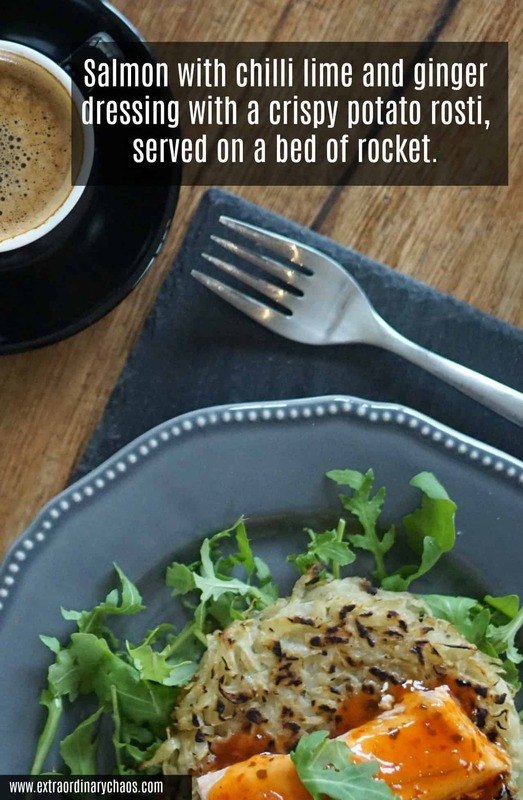 And the perfect dish to serve up for brunch. A couple of weeks ago I was lucky enough to go to the most wonderful brunch with some amazing bloggers and the lovely people from The Saucy Fish Co. Imagine someone who could exist on solely salmon alone getting to eat a 4 course brunch. I know heaven right? The team at The Saucy Fish Co. took us through some incredible brunch recipes, and showed us how brunch need not be a complicated affair. 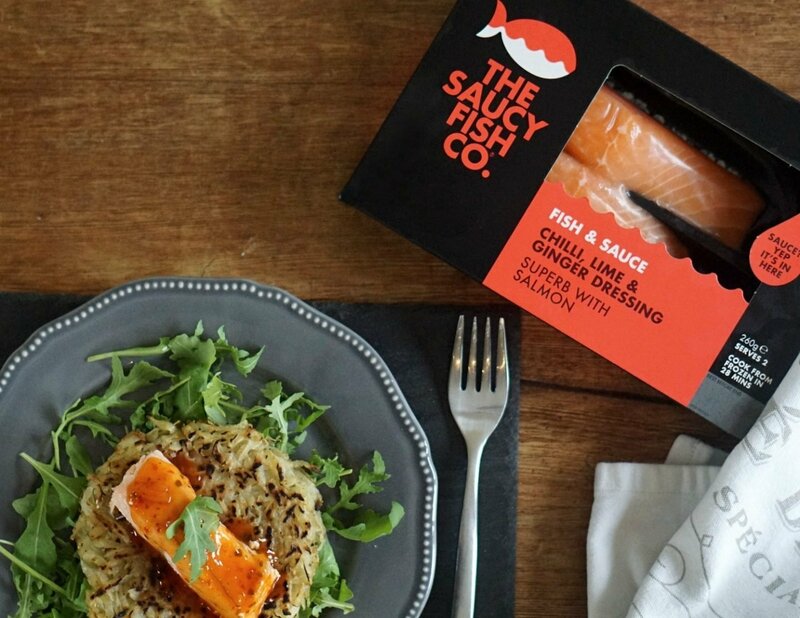 How, rather than re inventing the wheel, using Saucy Fish products is a simple way to create inspired brunch recipes with minimum effort. Leaving time to browse those Sunday papers for just a little longer. 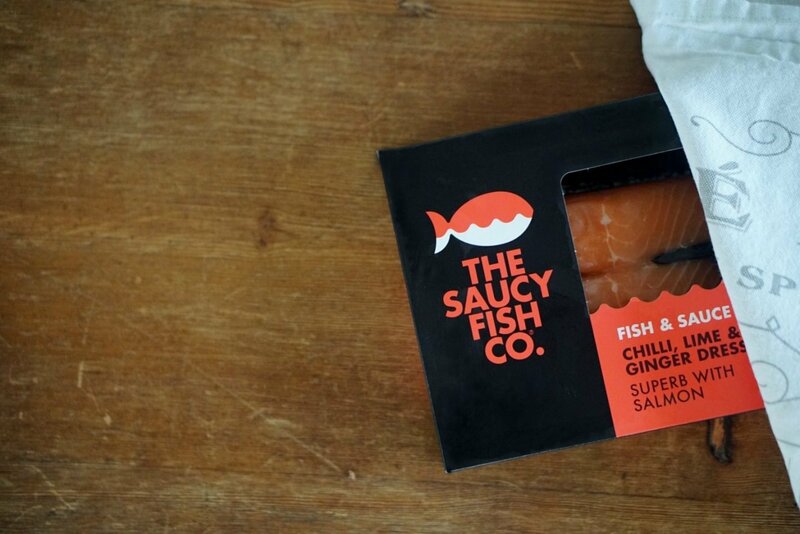 The fish is available online at The Saucy Fish Co. with free delivery on all orders over £15, the shop also offer’s alternates between 20% off and free delivery every month. Or alternatively can be purchased in the freezer aisles of Sainsbury’s and Tesco. 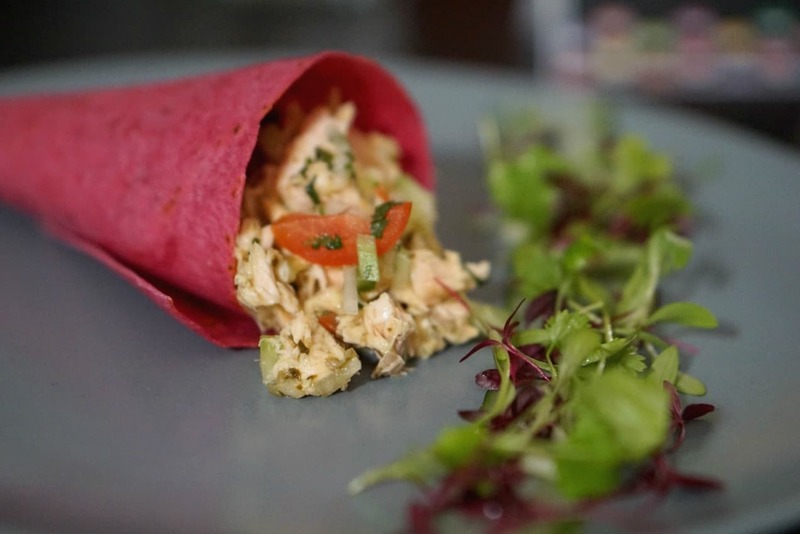 The breakfast wrap filled with a citrus cucumber and tomato relish, beetroot wraps and The Saucy Fish Co. Steamed Salmon with Lime & Coriander Dressing. 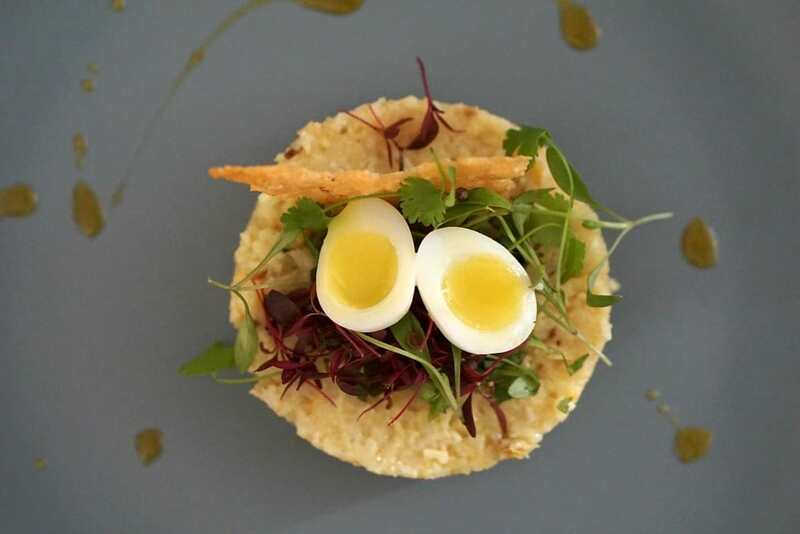 And the Smoked haddock kedgeree served with The Saucy Fish Co. Smoked Haddock with Cheddar and Chive Sauce. It’s wonderful to have a new repertoire of recipes to try out, and anything that tastes great, and saves time without compromising on quality has to be a winner? 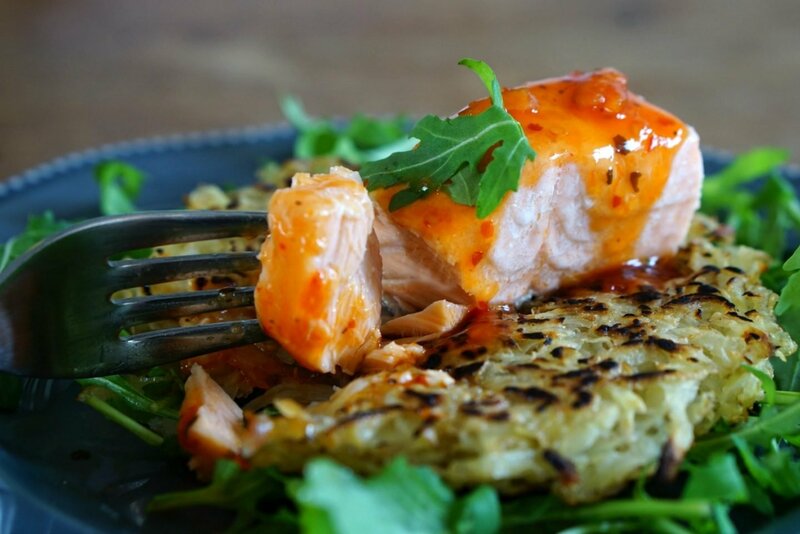 Potato rosti are so quick simple to make, taste amazing yet look pretty impressive to guests. Like you have made loads more effort than you actually have. The recipe is quick, tasty and looks great. When the salmon has been cooking for 10 minutes, wash and grate the potatoes with the skin on into a clean tea towel, squeeze out excess starch but do not over squeeze, you need to keep a little to bond the mixture. Transfer 2 pressed rosti to the hot butter with a spatula and cook for 4 minutes on each side, repeat with the remaining 2. 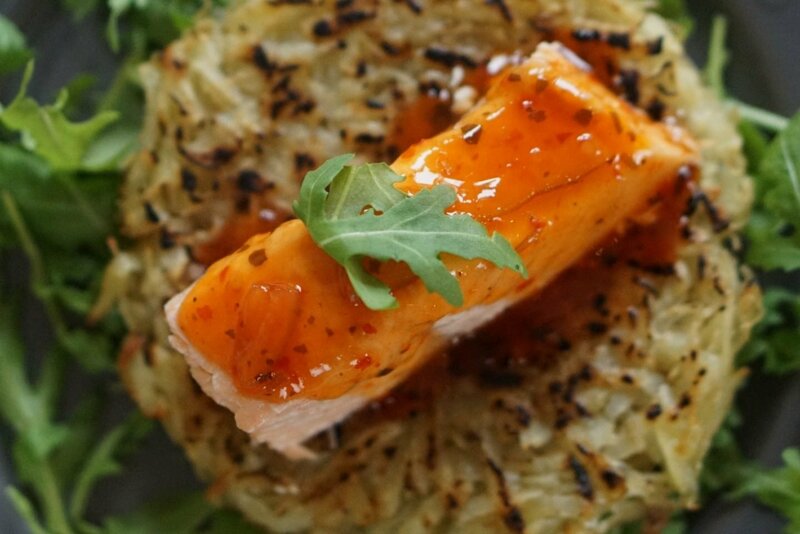 Cut each salmon portion into 2 and serve on top of the rosti, carefully pouring the heated sauce over the cooked salmon. Oh this sounds as good as it looks my goodness – DELICIOUS! Well done on the food styling sounds like a great blogger meet up too. Take me with you next time lol love a good food gathering. I LOVE salmon! Not sure I could eat it anytime other than an evening meal, although having said that this looks delicious. My husband doesn’t like salmon so I rarely get to eat it, only when my Mum comes to visit.